"Here, participants get to apply their highly specialized skills in addressing technological challenges that extension officers, agricultural scientists, rice farmers, or consumers face," says V. Bruce J. Tolentino, IRRI deputy director general for communications and partnerships. The challenges list keeps growing, but the one goal is to have better solutions for rice stakeholders. "We’re looking for web and mobile apps to help solve some of the toughest problems we face in rice research, ranging from complex computational problems to the creative use of games and social networking," says Marco van den Berg, chief information officer at IRRI. "The Hackathon strengthens IRRI's efforts to build a platform of digital tools for rice sector players—farmers, extension agents, entrepreneurs, and government managers," adds Dr. Tolentino. "We hope that it will also be an opportunity for ‘hackers’ to have fun while applying their IT skills to solve real world problems." 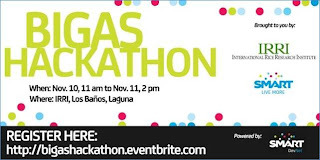 Join the BigAs Hackathon by registering for free via SMART sign-up. Awards are: Best Game App, Best Research Data Collection App, Best Farmer InfoTechnology App, and Most Innovative App/Special Jury Award. Each member of a winning team will receive a Samsung Galaxy Pocket and Smart Bro Plug-it. 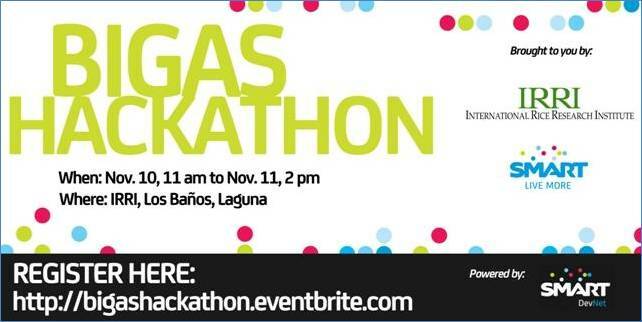 The activity will take place at the IRRI Library in Los Baños, Laguna, from 11 a.m. of 10 November to 2 p.m. of 11 November.